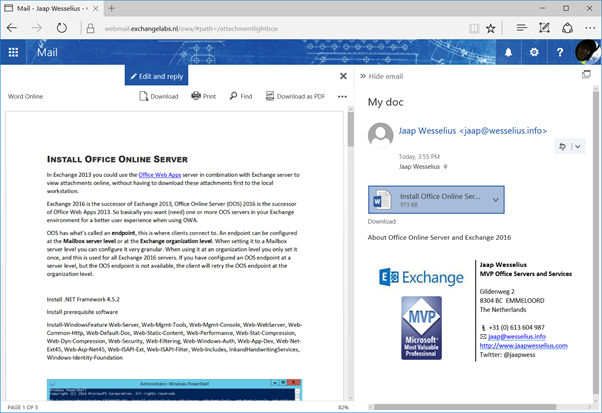 In Exchange 2013 you could use the Office Web Apps server in combination with Exchange server to view attachments online, without having to download these attachments first to the local workstation. Exchange 2016 is the successor of Exchange 2013, Office Online Server (OOS) 2016 is the successor of Office Web Apps 2013. 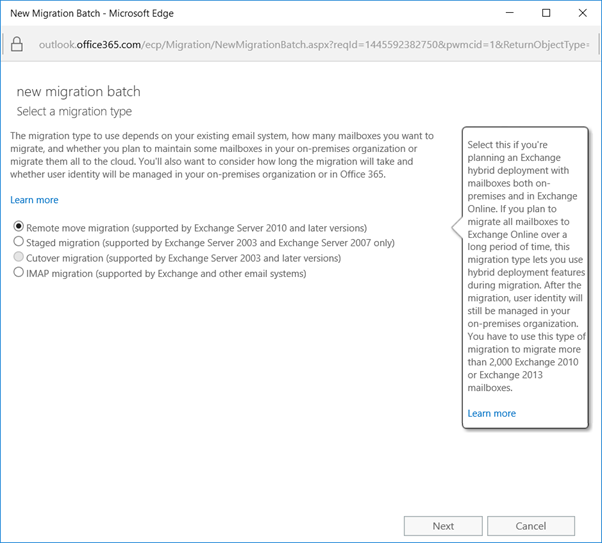 Now, when you want to move a mailbox from Exchange on-premises to Exchange Online, navigate again to the Exchange Admin Center, and under recipients select migration. Click the + icon and select migrate to Exchange Online to start the new migration batch wizard. For the migration type, select Remote move migration which is supported by Exchange 2010 or later. Click Next to continue. Select the mailboxes you want to migrate to Exchange Online, you can use the people picker feature (click the + icon under Select the users that you want to move) for this, or you can use a CSV file to select the mailboxes you want to move. 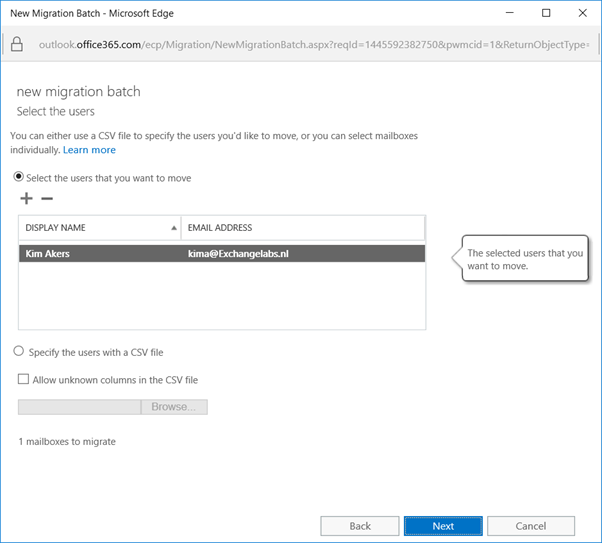 These steps will create a hybrid configuration between your on-premises Exchange 2013 environment an Exchange Online, but to move mailboxes from Exchange on-premises to Exchange online (or vice versa) you need to create an endpoint. This an on-premises Exchange 2013 server (but it can be more) where the Mailbox Replication Service (MRS) is running, used to move mailbox data from one server to another. The process is similar to an on-premises mailbox move where the MRS is responsible. 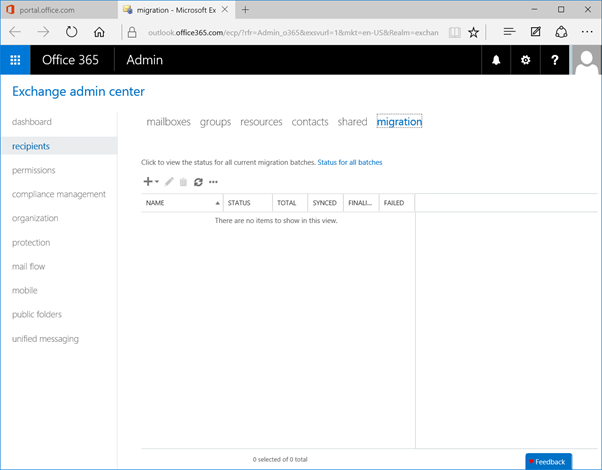 To create an endpoint you have to go to the Exchange Admin Center in Office 365 and login as an Office 365 tenant administrator. You can get there via the Microsoft Online Portal, select Admin | Exchange, or navigate directory to the Exchange Admin Center, and login as an Office 365 tenant administrator.